INNA: “I was wrong about her. Like I was wrong about Mara. What else have I been wrong about?” I’m interested in the chasm you describe while the brothers dive in the Palankar reef. No light penetrates. The abyss is unfathomable. Your story presents Jake with difficult choices at every turn, and as things get stranger and stranger, it seems he’s less and less sure of himself, of where the other characters fit into his notions of the natural world, and of what path it is he’ll follow, in the end. Do you think it’s possible for a human to ever truly know him or herself? DANIEL: I think it is possible. Perhaps it is our yearning and the individual paths we follow to make meaning of our lives that define us. Or maybe just our actions in doing so. I like to think that Jake while unsure of how things are “adding up” around him becomes sure of himself or at least chooses a path at the the end. While he remains unsure if anything supernatural has transpired and if so, what, he is sure that it no longer matters and does decide that he will not follow his brother. Despite his efforts and desire to rescue him from either himself or from any supernatural influence he is sure he can not “save” his brother or anyone. I think in life people struggle with what it is they know or think they know but are defined by these moments of clarity or just choice as evidenced by definitive actions. INNA: When Mara leads Jake on the search for his brother, the characters they encounter are classified as either clownfish or anemone. Then roles are changed as Jake’s perception shifts. Tell us about this disturbance in the order of things and how perception affects reality. DANIEL: I am glad that you asked about that moment in the story. Jake very notably in the story had been judgemental of Mara a young woman who lives a very different life and kind of life than Jake. Both Mara and Stephen made different choices than Jake, so different than Jakes “American-suburban-life” he can barely comprehened of “perceive” what their world view is and how they fit in. The concept of “rescuing” someone is very judgemental even demeaning through this lens. The moment you speak of is where Jake comes to recognize an inherent “power” in Mara, while perhaps nothing overtly “supernatural” his instincts are flaring in recognition of “something”. This is a powerful moment where he realizes he has been wrong about her. To that point his attitudes and actions towards her were portrayed as ugly and demeaning. It is a moment of an epiphany a moment of respect. While Jake (and the reader) never comes to understand what is going on- I like to think moments like this are in-roads to greater understanding of both the magic and mystery of our human lives and greater understandings and mysteries larger than ourselves, individually and collectively. INNA: There is a monstrous, otherworldy creature who emerges from the the depths of a cave and mirrors the shape of the brother, but the ghostly being is unclothed. Do you consider that our natural state is something beastly and alluring, that’s lurking beneath the surface and waiting for the opportunity to take over, if we let it? DANIEL: That is a cool way of looking at that scene and a thoughtful question, thank you. It is also very interesting that you “come down” on the side as interpreting what transpired as something “otherworldy” and definitively a creature. My intent in that scene is to portray something that could be a figment of nitrogen narcosis experienced from troubles on a dive or could also be something supernatural depending on how any given reader interprets what is presented. Going with the notion that a monster does indeed replace Stephen, I think you have enunciated a very potent notion. In life there is the “world of the submerged” in our selves, in others, and in general layers of the world and mechanication that are there and operating beyond our reach for many reasons both earlty and even other-worldly. In fiction the monster- the supernatural- the other is a potent way to explore these things. Certainly something I’m interested in writing about and reading about. I’m not sure if “the beastly” is our natural state or even if our “submerged selves” or any “submerged world” is waiting to take over… but it certainly is potent avenue of inquiry. I think both as individuals and as a society repressing or not embracing to a degree “the darkness” or shadow as sometimes referred to leads to complications even outright problems. Our world is a world of light and dark- both literally and “figuratively” so it makes sense that these concepts would be part of the natural way. While the “beastly” might not naturally be waiting to take over- nature abhors a vacuum and perhaps the beastly or the darkness is waiting for some sort of equal air time- in our lives and all of our lives. Could so much of the ugliness we see today be a part of this? Certainly something to think about. I really like that you posed the question. 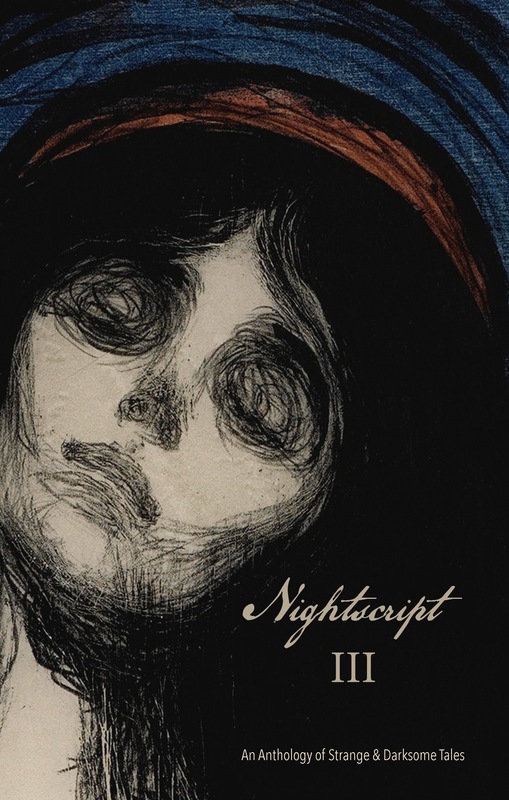 You can read both of our stories in the anthology Nightscript 3. All three volumes of the anthology series in the Kindle format were on sale last time I checked and might still be on sale now. In any event the book can be found on amazon and from the publisher. More about the story and the book to follow.